Is your business in The Woodlands still using traditional telephone systems? Do your staff members complain of playing “phone tag” with co-workers and prospects or customers? If you answered yes to either question, your business is likely at a huge competitive disadvantage. Poor call redirecting, long hold times, and unreliable connectivity can cost thousands (more for larger businesses) each week in lost productivity. Integrated communication solutions can eliminate this and many other money-wasting activities. Both small businesses and companies with large corporate campuses are rapidly abandoning antiquated business phone equipment in favor of technology that takes advantage of unified communications. Companies opt to invest in the new business telephony and associated applications for a variety of reasons, but the most important one is greatly increased productivity. As you know, productivity directly affects your company’s bottom line. The experienced, highly trained team of professionals at Action Communication can work with you to assess your firm’s unique business telephone system and additional communication needs. The Action team will help you choose between on-site based systems and cloud-based solutions. This is a critical decision because it can have a long-term impact on business communications, which affects everything from productivity to vendor and client perceptions of your company. Our certified engineers and technicians have the knowledge and experience to help you make the right decision — one that precisely fits your current needs, yet includes flexibility that easily accommodates company expansion.  Action Communication provides a comprehensive suite of business telephone systems and equipment as well as cabling services for all technologies. In addition, we offer advanced video surveillance and overhead paging systems to further enhance control and communication. Do your employees use smartphones and tablet devices for business activities? We design and install state-of-the-art business applications for these devices, including: media management, mobile messaging, system networking, telephone software integration, cloud based telephone services, SIP trunking, and employee access control. Stop wasting money and operating with suboptimal productivity levels by taking action with Action Communication now!